LONDON (Sputnik) - UK Prime Minister Theresa May said that UK experts identified the substance used in the incident of the poisoning of former Russian intelligence officer Sergei Skripal in Salisbury as belonging to the Novichok group of nerve agents, the UK government said Thursday in a statement. Earlier in the day, May met with French President Emmanuel Macron and German Chancellor Angela Merkel in Brussels. "The Prime Minister provided the President [Macron] and Chancellor [Merkel] with a detailed update on the investigation into the reckless use of a military nerve agent, of a type produced by Russia, on the streets of Salisbury. She said there had been a positive identification of the chemical used as part of the Novichok group of nerve agents by our world leading scientists at Porton Down," the statement reads. According to May, Russia used to produce the Novichok agent. "The UK, Germany and France reaffirmed that there is no plausible explanation other than that the Russian state was responsible. The leaders agreed on the importance of sending a strong European message in response to Russia’s actions and agreed to remain in close contact in coming days," the statement added. Skripal and his daughter have been in hospital in a critical condition since March 4 and are being treated for exposure to what the UK experts believe to be the A234 nerve agent. 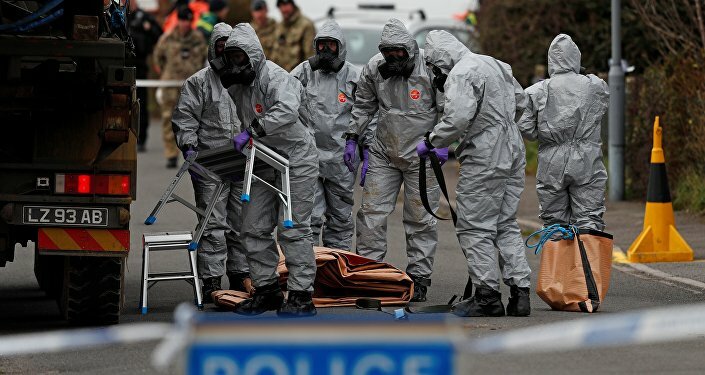 The UK side claimed that this substance was related to the Novichok class nerve agents developed in the Soviet Union. UK Prime Minister Theresa May has accused Russia of orchestrating the attack on the former intelligence officer and expelled 23 Russian diplomats as a punitive measure.